All three are Sephora by OPI, which unfortunately is being discontinued. Get them while they last – great formulas! I know what you’re thinking – why is there a Chapstick in that picture? This manicure can get a little messy, so it’s best to protect your cuticles and skin with Vaseline. After you’re done, you can wipe any excess polish off with a tissue (much better for you than using acetone, which can be absorbed through your skin). I didn’t have any Vaseline on hand so I substituted Chapstick, which has a similar petrolatum base. Choose any three polishes, but the best effects will be from three adjacent colors on the spectrum (green, blue, purple would be an awesome alternative). Apply these in stripes on a makeup wedge sponge. At first you’ll need to load a fair amount of polish onto the sponge until it’s saturated. See what I meant about this getting messy? If you cover that skin with Vaseline, it creates a barrier than can be easily wiped off. I recommend using a patting motion to apply the polish. 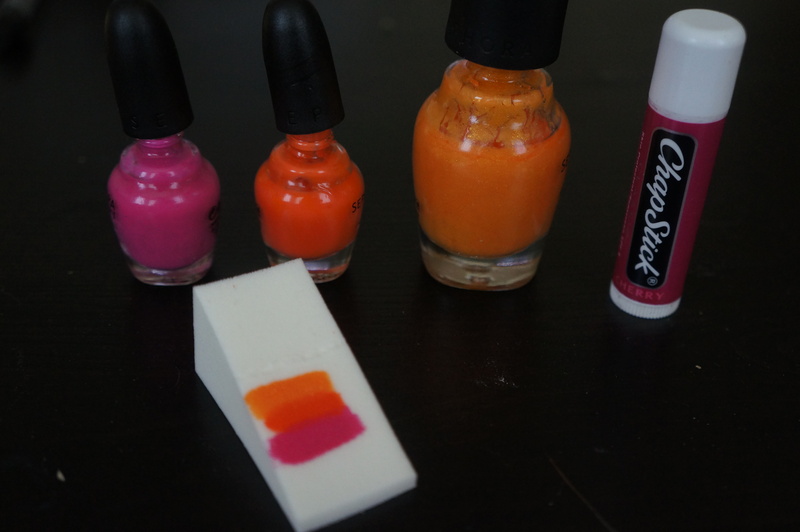 Tap the sponge over and over on the nail in the same spot, making slight shifts up and down to help blend between the colors. 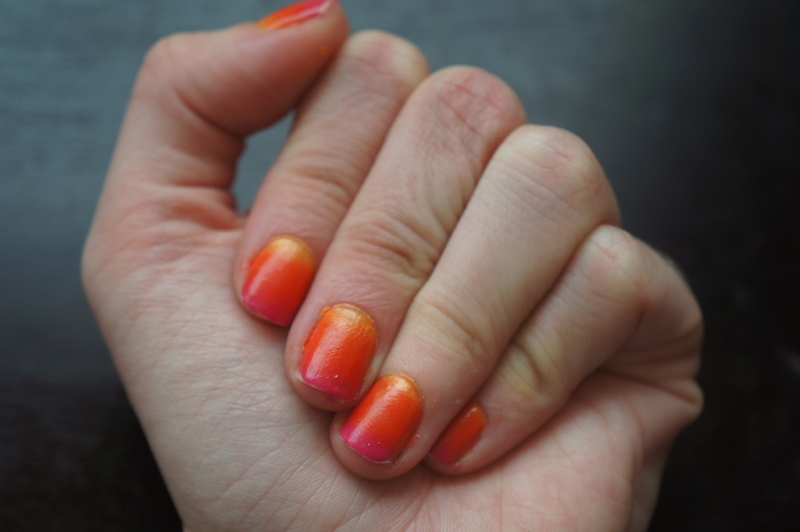 After you’ve covered all of your nails in polish, clean off the extra polish, or leave it on if you’re feeling avant-garde. Let the polish dry for at least 20 minutes (yes, 20 minutes). Because it’s one very thick coat (rather than the standard two thin coats of polish), it needs extra setting time. I know it’s near impossible to do wait that long, but throw on a Hulu episode of Daria and keep your hands folded in your lap. Finish with the top coat of your choice. I used to be a diehard Seche Vite fan, but the formula gets gloopy so quickly! They even sell a special nail polish thinner to help with this widespread problem. I’d rather just buy a single top coat that won’t turn to goop after a month. 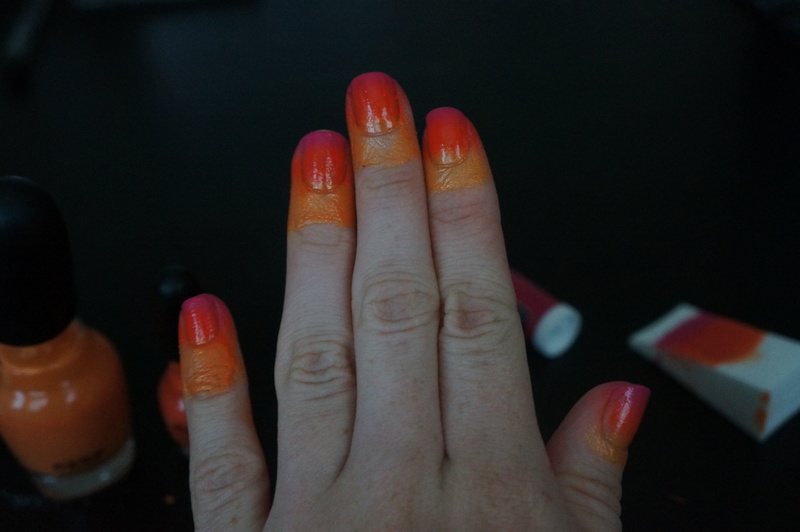 I’m currently testing out Julep Freedom Polymer Top Coat – will report back later with results.